The awesome guys at Madi International and Wella Professionals wowed crowds at the Middle East Beautyworld making it a runaway success. The Beautyworld Show looks amazing and I’m sulking about it closing so early at 7pm….I only finish work at 5.30pm so getting to DWTC takes half an hour leaving not much time to see most of the show which this year is so brilliant. 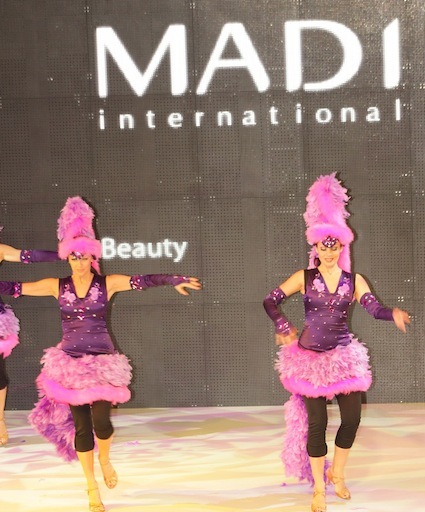 But I’m glad Madi International, one of the Region’s leading distributors of internationally reputed professional beauty brands made Walk of Beauty 2012 a grand success by showcasing the latest trends in hair-styling from across the globe. Organised in conjunction with Beautyworld Middle East and powered by Wella Professionals and P&G Salon Professionals, people have one more day to enjoy the show…I will be on a plane to Bahrain and wish I was actually in Dubai to check out the whole show but fate has other plans for me. I would be splitting a gut to get back to Dubai the same day to see my daughter perform on stage and making it to her show is looking pretty slim right now. I saw a video clip of last year’s Walk of Beauty at Hard Rock Café (my new hangout) and was amazed…this years is even better. The iconic event demonstrates the 2012 hair-styling trends, presented live as part of an audio-visual show on a purpose-built catwalk stage by Wella and Kadus Regional Education Team and ambassadors. Besides this, talented and professional hair dressers from leading salons in the UAE and region also showcase their skills live. Walk of Beauty 2012 is supported by Hard Rock Café, Dubai, the partner-sponsors along with In Dubai We Trust [IDWT] Foundation, a non-profit organization that started on December 2, 2009 and striving to unify the multi-cultural population of Dubai by celebrating the Emirate’s achievements. Hard Rock Café, which opened in London in June 1971, reopened its Dubai café at Festival City and is the largest in Middle East. With a strong international profile, Beautyworld Middle East, organized by Messe Frankfurt, has played a major role in the last 15 years in contributing to the growth and development of the beauty and wellness industry in this region….I had fun at Hard Rock Café with a few old pals and got to meet IDWT (awesome team) and caught up again with Madi Team….it has been a couple of months since we last met when they opened their biggest showroom and I enjoy the company of Madi staff who have a vision to be on top of the game in their industry by cultivating a culture of success and warmth amongst their teams. Unlike me, if you lucky lot are still in Dubai tomorrow, check out the Beautyworld Middle East as well as The Walk of Beauty. You won’t regret it.